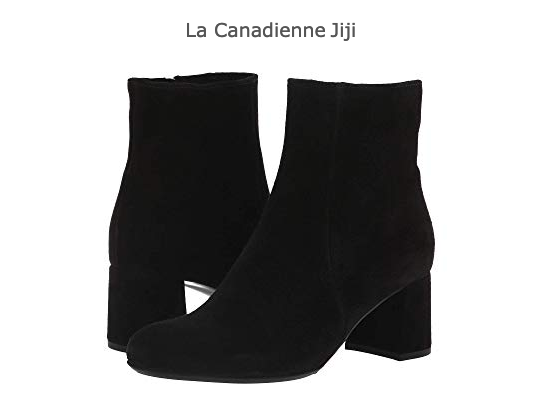 Anyone who has attended one of my job market-related webinars knows that I always mention La Canadienne boots as an awesome option for cold-weather campus visits. Insulated for warmth, they are totally waterproof (“guaranteed waterproof for a period of six months”), have a highly grippable rubber sole for snow and ice, rounded toe for comfort in a lot of styles, and stable block or wedge heels. But the styling is so sleek, you’d never guess how functional they are. 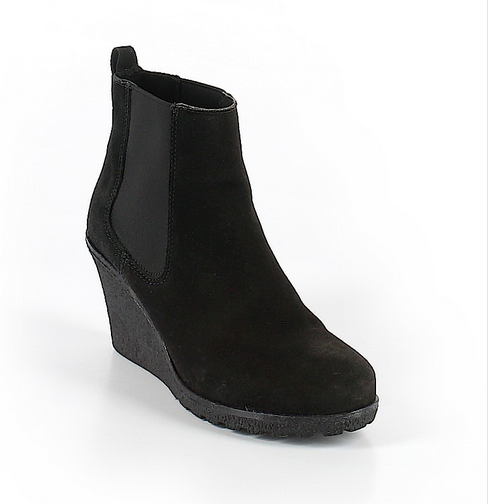 And they come in so many styles and heel heights. How do I know all this? Because this month I just bought my first pair in about a decade, and spent a solid week on the interwebz searching for a decent price. And… they’re as wonderful as they were back when I was an assistant professor looking for a sleek high heeled boot that could stand up to rainy Eugene, Oregon. 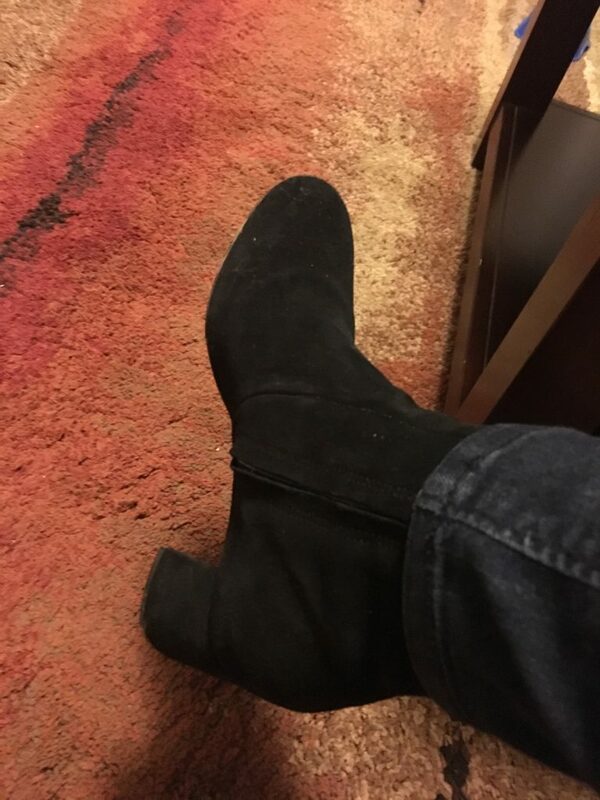 These days, at age 54, and running a business from my house where I pad around barefoot for most of every day, I’ve had to scale down my heel height a bit, and exchange my beloved pointed toes for rounded or square options, but I do still love a sleek black boot. The style I got is Jiji, and I found a great deal on them. And I am here to tell you that I can once again vouch for the functionality of La Canadiennes. I wore my new pair for two solid very cold days of marching around the University of Vermont campus with my son last weekend, on his Admitted Student Visit, with almost no foot pain at all (which is saying something at my age), and staying warm and dry. And because I know the brand from years back, I can say with confidence that, well cared for, they’ll hold their shape, comfort, and waterproof function for years. I wore my last pair for almost a decade. 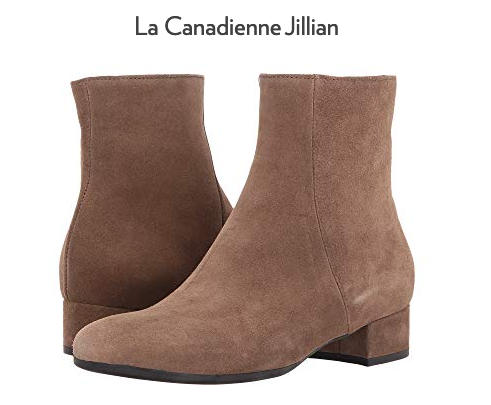 I know that every time I give a webinar, and mention La Canadiennes, at least one person follows up to ask, “what was that brand again?” Comfortable, functional footwear for the campus visit – especially on snowy northern campuses – is a serious struggle. I’ve always felt anxious about recommending a brand that is so expensive, even though I always take pains to tell people to shop 6PM.com first. 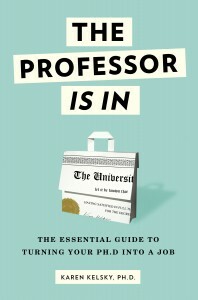 I’m just really glad that internet secondhand stores have brought this brand closer to an academic budget. 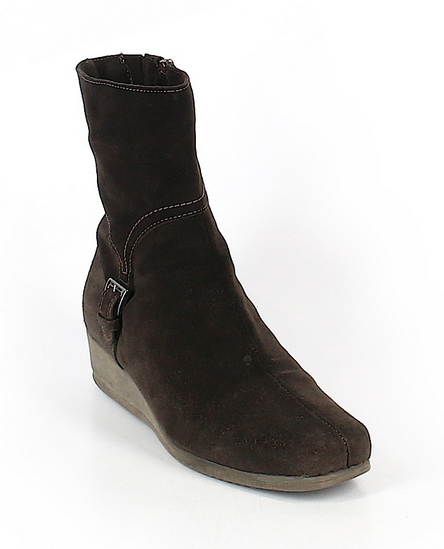 I was just browsing ThredUp for this post, and saw these wedge style – on sale for about $100 (size 8). La Canadiennes are worth taking time to search for. They’re really worth whatever price you pay, and I’m glad to have a pair in my wardrobe again. Giveaway: OK, so this post is definitely not about makeup! But I have a ton of new makeup and skincare samples to give away. So, comment on FB about boots or anything else related to makeup, skincare, or fashion and the academic life, and once again I’ll do a random giveaway for a collection of 5-6 unused or barely used samples – usually prestige brands! Best boots ever. Thanks for info about discount sites. Thanks for the reminder. After almost 10 years I had to give up my favorite La Canadienne boots. Based on this post I went to L&T website and got two boots for next fall/winter for less than what one pair of boots cost. I’m set for the next 10 years (I hope).